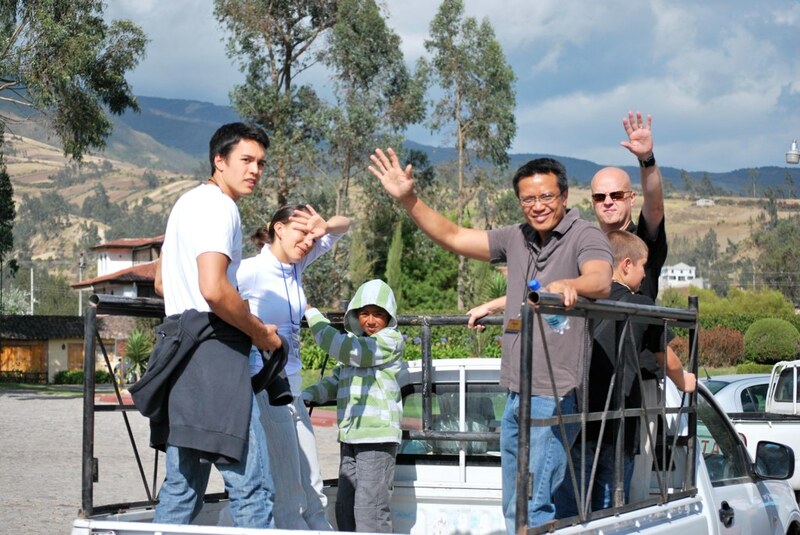 Many of you know that my nineteen year old son, Justin, and I recently returned from a missions trip to Ecuador, guests of Compassion International. There is nothing like an overseas missions trip to give one a sense of perspective, and both of us have had our perceived worlds expanded through the experience. So it was with great appreciation that we accepted the offer from the twins (and their teacher, Mrs. Banks) to visit their fifth grade class and tell them about our trip. All kidding aside (and Justin was actually adolescently mesmerizing), I struggled a little with the whole idea of sharing our trip with these fifth graders. I was even having trouble simply sharing it with Rachel and Paige. We live in an upper middle class neighborhood, where the children play in soccer leagues with brand new matching uniforms, all own X-Box or Nintendo DS systems, are able to access hundreds of TV stations on their large flat screen TVs. 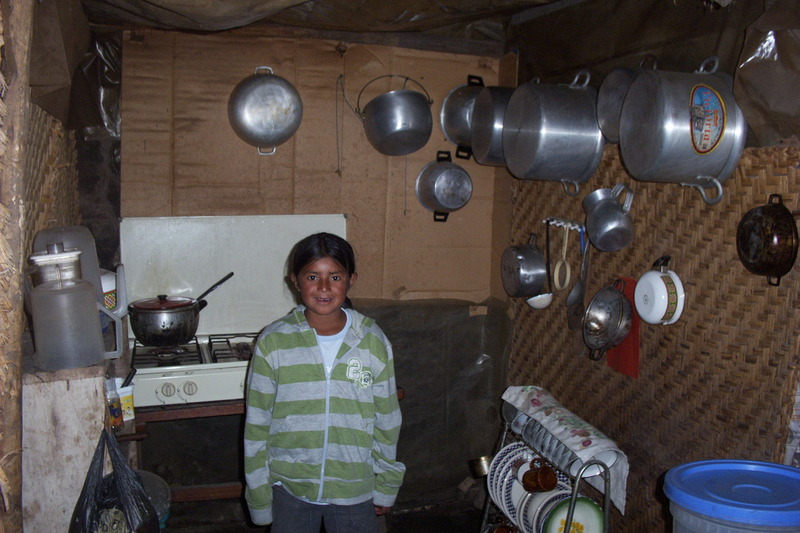 The idea of real poverty–that a large portion of the world still does not have clean and drinkable water (much less plumbing), or has dirt floors in their small homes (if they have a home), or access to basic medical assistance or education–is difficult to express to these children. How do I help these children gain a compassion for people they don’t know? How do I help them gain an appreciation and thankfulness for the privileged lives they lead? How do I help them make their own perceived worlds bigger? So Justin and I told them our story. Of how we took the long plane trip from Sacramento to Dallas to Miami to Quito. Of how we visited different project sites and met all of these beautiful children who have been given hope through the physical, emotional, and spiritual efforts of Compassion. Of how we encountered a group of people who were very different than us, but were very similar to us. Mostly we talked about meeting eleven year old Jefferson and his family, and how we spent half a day with them. We told them about how Jefferson wanted to be a soccer player or a carpenter when he grows up. We told them how Jefferson is able to go to school (school not being a given) and how he and his unborn sibling are being taken care of by Compassion. We told them of walking the dirty, dusty streets of their town, of visiting their church, of picking strawberries in the field that his father leases. We told them how this is the only way that they make money, earn a living, feed the family. There were good questions. Justin and I contrasted how much money an Ecuadoran earns per day (about $7 per day) versus how much they get in allowance (about $20 per month). We contrasted how many Ecuadoran people sleep in one room (an entire family) versus how they live (many children had their own bedrooms). We talked about buying Jefferson a soccer ball as a gift, and how grateful he was to have it (as he hardly had any toys at all). In the end, I think they were starting to get it. Many of the children talked about being thankful for what they had and for the school they go to. And the biggest thrill for me was getting thank you hugs from Paige and Rachel at the end. Later, as I thought through the events of the day, I had this picture in my mind of Jefferson. What if he were suddenly transplanted from his modest home in Otavalo, the one with no plumbing and two light bulbs and no floor, and dropped into Rachel’s and Paige’s classroom, with its high-tech multimedia system, Promethean interactive white board, row of computers, and children in designer clothes. What would he think of us? How would he act? And how would we respond? I would like to believe that he would be welcomed in and befriended by my children and their classmates. I would like to believe that he would soon be out on the playground, smiling, laughing, and kicking a soccer ball with his new friends in El Dorado Hills. For as much as we were so warmly welcomed and invited into the lives of our Ecuadoran friends, I would hope the same of us. Posted in art, Blog, christianity, faith, missionsTagged art, Compassion International, Ecuador, faith, missions, QuitoBookmark the permalink. Great post! I had to laugh at Justin and his opening line, that is awesome. Thanks for sharing your heart too. I have friends in Ecuador this week and I am simply jealous.